He did so to correct a “somewhat misleading (in my opinion) presentation of these numbers [that] has been floating around on the web recently.” The misleading graph, which appeared on a National Geographic blog, was — I agree — a confusing way to show information better represented in a scatterplot. But I’ve seen this data before, and there’s more to the story. Neither the National Geographic nor FiveThirtyEight has anything to say about which numbers they’re charting. Back in 2005, in a review of John Abramson’s excellent book Overdo$ed America, I noted that he had used a different source to reach a slightly different conclusion. He used it to make the oft-cited point that US healthcare isn’t just wildly expensive, but that it also correlates with worse life expectancy than in many countries that spend less. The U.S. is the clear cost outlier on both charts. 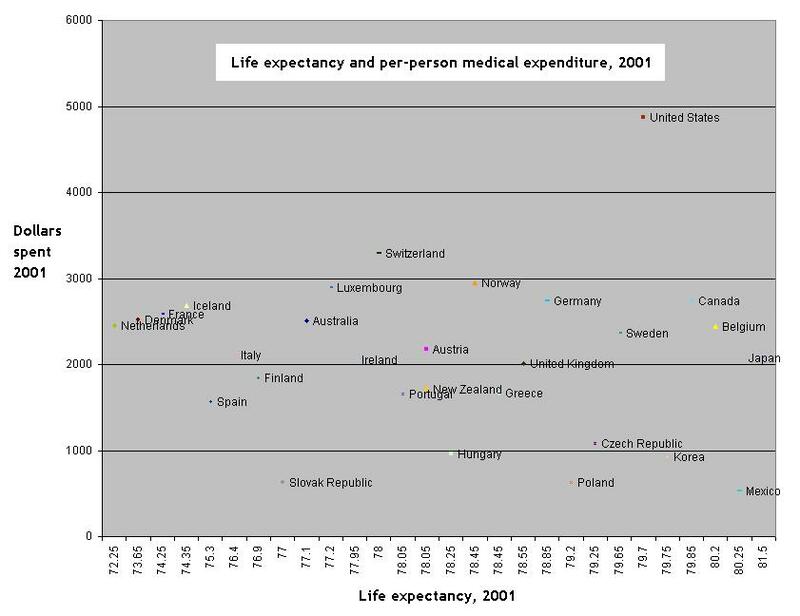 The first chart, however, places us near the low end of the life expectancy range, justifying Abramson’s assertion that we combine “poor health and high costs.” The second chart places us near the high end of the life expectancy range, suggesting that while value still isn’t proportional to cost, we’re at least buying more value than the first chart indicates. Although based on older data, this second chart closely resembles the ones recently shown and discussed by the National Geographic and FiveThirtyEight. Would we generally agree that we should measure the value of our health care in terms of healthy life expectancy, not raw life expectancy? That the WHO’s way of assessing healthy life expectancy is valid? These are kinds of questions that citizens have not been able to address easily or effectively. Pushing the data and surrounding discussion into the blogosphere is the best way — arguably the only way — to change that. That was five years ago. The data was, and is, out there. So it’s disheartening to see the same chart pop up again without any further discussion of the sources of its data, or of the definitions underlying those sources. The x scale on those excel plots doesn’t look right – they are not equally spaced. It’s also customary to put the (putative) response on the y axis, so the plots would be more natural with spending on the x and life-expectancy on the y.
I can’t lay my hands on my copy of the book at the moment, but my recollection is that I recreated the first chart to match what was done in the book, and then made the second based on OECD vs WHO life-expectancy data — both of which sources were cited in the book. It’s not the data that I’m questioning – it’s the presentation. Look at the values on the x-axis – there is not the same amount of space between each one! It appears the two diagrams are using ranked data for the x axis. Also, what OECD data set is this? Looking at the OECD dataset on their website (http://dx.doi.org/10.1787/544223472072 , see http://stats.oecd.org/Index.aspx?DataSetCode=CSP2009) gives US life expectancy in 2001 as 77.1, ranking 23d of the 36 OECD countries. There’s a higher figure closer to what you give above for female life expectancy? Not sure what you mean by that. It’s just years of life expectancy. Also, what OECD data set is this? The one that was cited in the book — which I can’t find at the moment. In any event, the point I’m making is that that the recent revisualizations of this stuff are all based on OECD data alone, so far as I can tell. 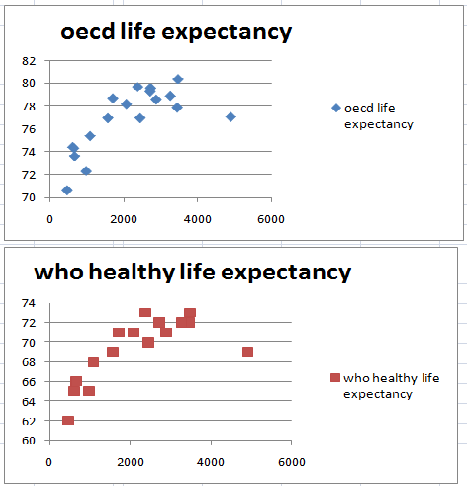 But a comparison of OECD and WHO data invites a discussion of which definition of life expectancy is appropriate — and, so far as I’ve seen, that discussion hasn’t happened yet. Sorry my reply crossed mid-flight there. re the ranked data: This was in response to Hadley above. I just mean the points have been sorted by value along the x axis, then plotted above a label showing all of the actual values. There’s no meaningful scale, as there was in the first graph, which makes it harder to spot outliers. re your second point, I must’ve misunderstood, I thought your third graph above was supposed to be the OECD vs OECD comparison, the others used mixed measures? and finally re life expectancy… yes, which scale is used is highly contentious. Here in the UK this does come up in the debate every so often in a different context, as people generally want life-extending treatment no matter what the quality of that life would be; while NICE may recommend treatments based on quality-of-life adjusted outcomes. …you can see this corresponds closely to Gelman’s graph. Interestingly, there’s little if any difference arising from the different OECD and WHO definitions of life expectancy. Now I want to revisit the book and review the argument and supporting data. 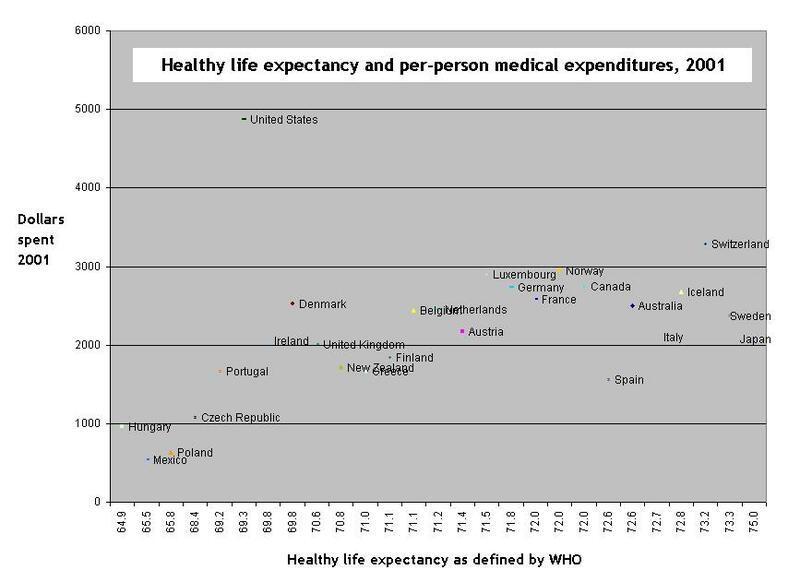 If you include all the countries, of course, you reframe the question of the longevity implications of US healthcare. In a whole-world view, we’re near the top. In an advanced-industrial-democracies-only view, we’re middle of the road. But I’m still left wondering about the relationship between longevity, health, and cost. Could you give me some sample code adding attendess with DDAY.ical. If you are going to get picky about data, shouldn’t you first think about terminology? There is nothing (or at least very little) health and care about “health care”. And the dollar numbers are not “costs” but “prices”. Once you substitute “medical expenses” for “health care” and “prices” for “costs”, immediately there is an improvement as to how to look at this. For example, my Blue Cross Blue Shield coverage helps me with my family’s medical expenses. The expenses are based on prices of goods & services. So, you should still be left wondering about the relationship between longevity, modern medicine, and expenses.